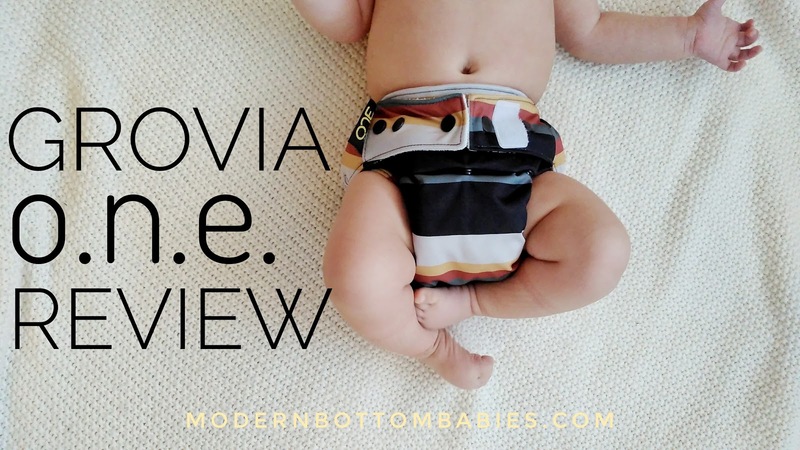 Here is a truly one-of-a-kind cloth diaper: the GroVia O.N.E. Outlast closure, No prep, Easy to use. 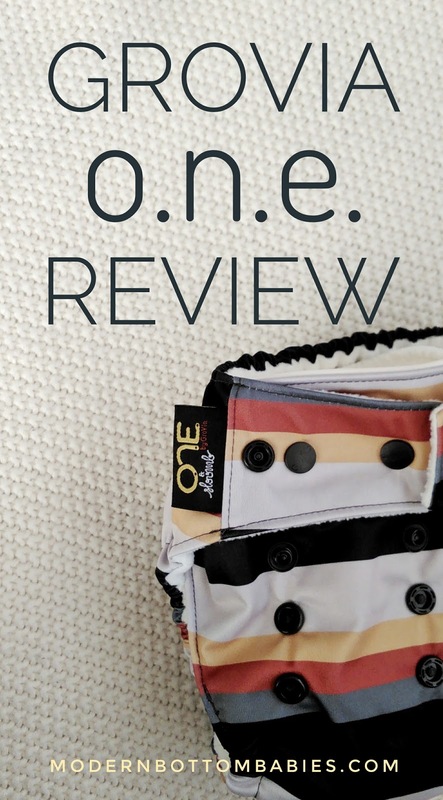 Though not exactly easy to remember, that is what the O-N-E stands for in this diaper's name. I am going to be super, super candid in saying that I had no interest in ever trying this diaper. I bought it and tested it with an extreme amount of skepticism. This post contains affiliate links. Purchases made through these links may compensate me for my referral, at no extra cost to you. This post is sponsored by YOU, and others who shop through my affiliate links, and allow me buy new products to share. This review is not endorsed in any way by the brands mentioned. All opinions are my own. Why was I skeptical? My impression of the ONE, as a spectator, was that this diaper was bulky, and made up of microfiber, which I am not a fan of. Turns out, I actually knew very little about this diaper. When I read about it, and then eventually bought it, I was pretty shocked by how many features it actually has. 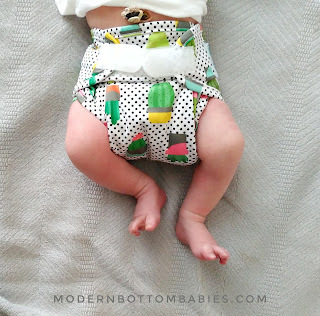 This has to be hands-down, the most unique diaper I have ever seen on the market. The GroVia O.N.E. is a one-size (fits from approximately 10-35lbs), all-in-one diaper. My first shocker came when I realized that it is not just a microfiber diaper. Though it has a microfiber core, the bulk of the absorbency is actually made up of cotton. 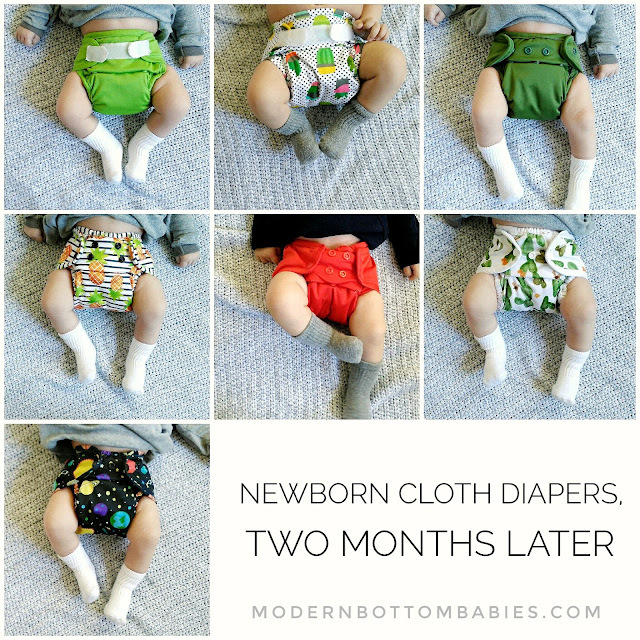 You know cotton, my absolute favorite textile- cloth diapers or not. The cotton in this diaper requires no prepping. It only needs one initial wash, then it is ready to go. The absorbency is made up of two soakers- one small, and one large. 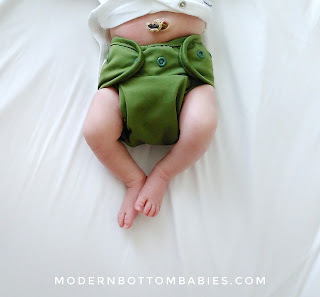 They are attached in the back of the diaper with a single snap, depending which size or amount of absorbency you need. Use the small soaker for lower rise settings and less aborbency, the large for higher rise settings and more absorbency, and both together when you need a lot of absorbency. The inside is lined with a stay-dry microfleece. 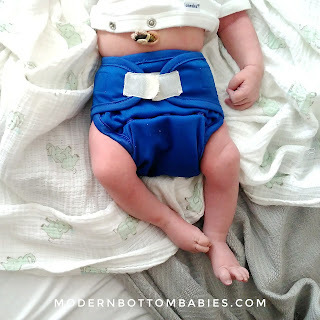 The really unique feature on this diaper is ability to switch between hook and loop and snap closures, thanks to removable hook and loop strips. Even with just the single, large insert, it's a pretty thirsty diaper. My two-year-old was the first to get this one on the bum, and when I changed him, it was SO heavy with pee. I was impressed it had held all that without leaking. A lot of people swear by this as an overnight diaper, with both soakers. My boys don't pee as much at night anymore, so I don't know if I am the best testimony to that right now. My biggest concern around this as a nighttime diaper is the microfiber core holding stink over time from being used with such concentrated pees. When my baby grows up, I'll have to try it for awhile and report back. If you follow me on Instagram, you know that I have three in diapers right now. This fits both my toddlers very well. It is quite bulky on my four-month-old, but a lot of one-size diapers still are. It is not as trim as my diaper of choice, but it definitely isn't as bulky as I had imagined, unless both inserts are in it. The price point is fair, especially for it's versatility. My biggest complaint about the ONE is honestly the packaging. The custom plastic packaging is just excessive to me. It's not something that could be recycled- or really reused, like the generic plastic bags can. I couldn't imagine buying a whole bundle of these diapers at once and getting dumped with all this extra packaging. It's a huge deterrent for me, personally. My least favorite thing about the diaper itself is the way it snaps in. It technically should qualify as an all-in-two, since the soaker unsnaps every.single.time. you wash it, and you have to chase it down to snap back in while folding. I also have this thing with soakers that attach in the back, because I always feel like poop is going to get trapped behind them during spraying OR the soaker ends up dropping down into the poopy toilet water. In time, I've come to not mind a little fluff, but I still wouldn't use this full-time, due to the bulk. There are all-in-ones out there that fit my kids much more trimly, especially my baby. I could just as well throw the hook and loop conversion straps in the trash, since I'm not a fan of that kind closure, but the fact that they are supposed to be removed for washing is a bit of a bummer for me. I don't even remember to fasten hook and loop fasteners onto their stay tabs to wash them, so I couldn't imagine ever removing the entire fastener. But maybe that's just me. I know this is totally personal preference, but I don't like microfleece linings. I prefer natural fibers against the bottom, plus it always just starts to look pilly and sad after a few washes. I will be buying this diaper again. I like it. It's absorbent, and is mostly natural fibers. It's a diaper I can trust to get us through a grocery trip, or church, without leaking. 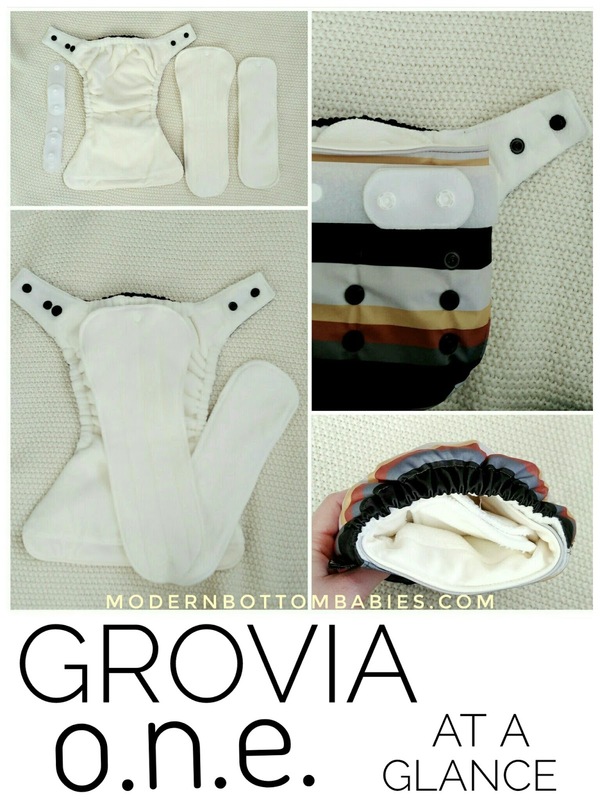 I recommend trying it if you are a GroVia fan, or looking for a diaper with good absorbency. And I HIGHLY recommend buying it in Basil, one of my favorite diaper solids, ever. I own a Basil Hybrid, but I think a ONE will be heading my way soon, too! 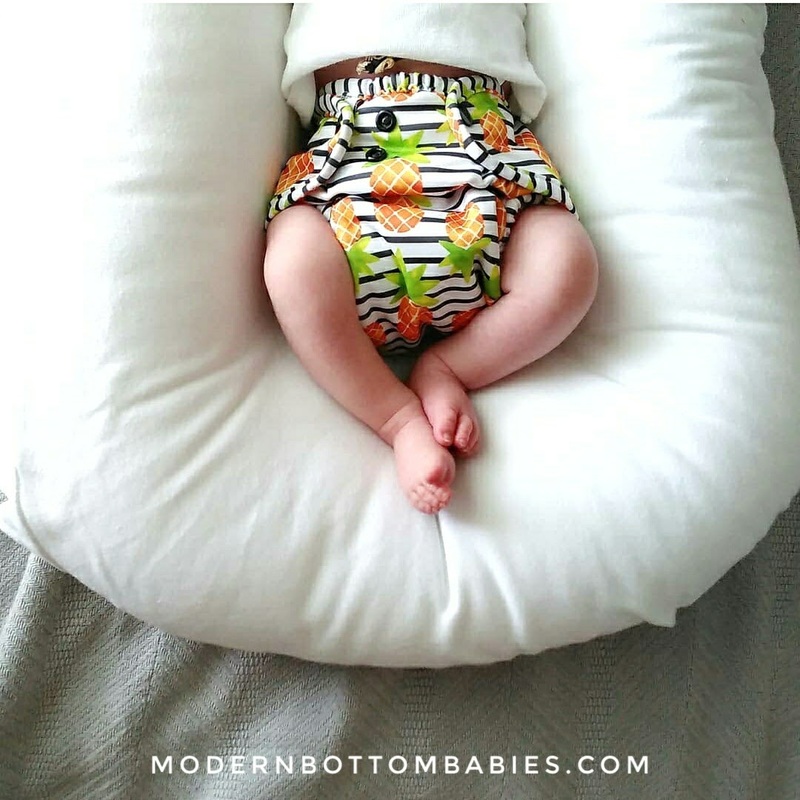 For more opinions on this diaper from other cloth diapering parents- check the comments of this Instagram post. This is the most polarizing diaper I have ever asked about! Click here to see my full list of reviews. I took on the overwhelming task of rounding up the cloth diaper sales this past Earth Day, and I said I'd never do it again. 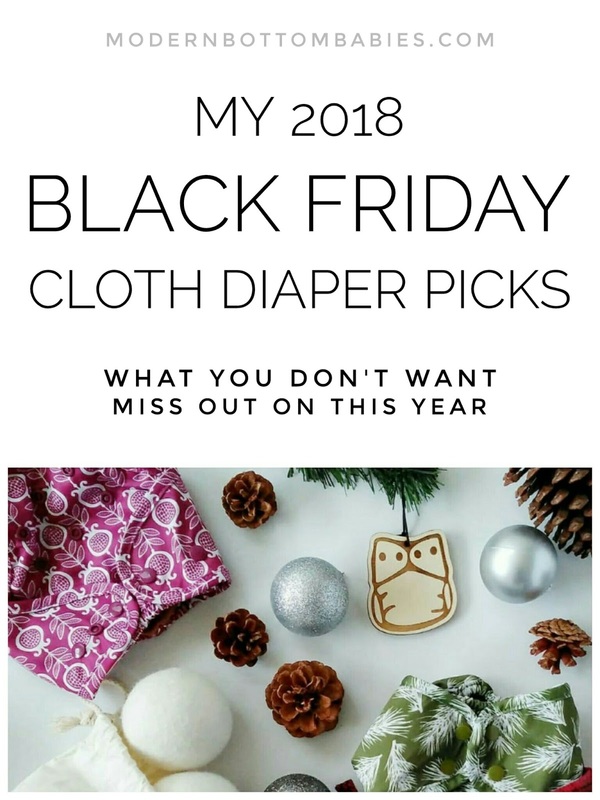 But Black Friday is here, and it is the biggest sale of the year in the cloth community, so I wanted to share the deals on my favorite products. This post contains some affiliate links. If you click through and make a purchase, I may receive a commission for my referral, at no extra cost to you. Affiliate sales help keep the light on for this blog, and allow me to test new brands and products to share with you, so I appreciate this support, a lot. 1. Spray Pal Sprayer and Shield: I bought mine last Black Friday, and it has been a major game-changer for me. This is THE time to buy, when you can get such a good deal on them. Spray Pal is 20% off at Diaper Junction (they carry the shield only). This is a not an affiliate, but I recommend keeping an eye on Spray Pal themselves to get the best deal- they did some pretty good door busters last year, including a free shield with the purchase of a sprayer (which was also discounted), so hopefully they will again! You can see my review on my sprayer and shield here. 2. 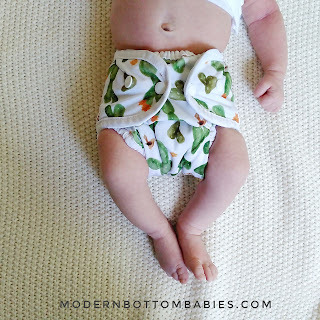 Wipes: These are one of my absolute FAVORITE cloth diaper accessories. If you want 'em, but you don't got 'em, now is a good time to buy. Love Thirsties, which are on sale for 20% off , and Grovia, which are also on sale for 20% off. 3. Not Just Butts: Well, I of course, need to mention that I am running a sale on my own website. 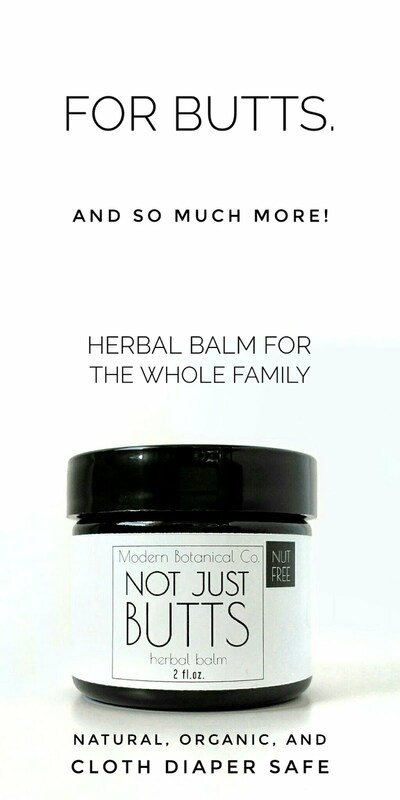 Not Just Butts is 15% off- with a free coffee lip balm (while supplies last, but they will)- and ALWAYS free shipping. It is an amazing cloth diaper- safe cream to use for everything from rashes, to irritated-from-wiping-noses. This coffee lip balm sample is a tester for a new product I will be offering next year. I am SO excited about it, because it is SO good. 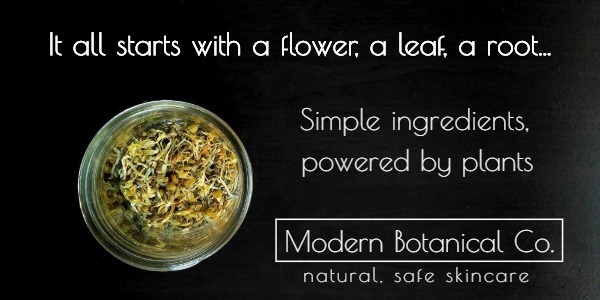 It has real coffee infused in it, so it has a real, wonderful coffee aroma. I freak out a little every time I use it because I love it so much. 4. Newborn Diapers: If you're expecting, and want to cloth diaper a newborn, PLEASE do yourself a favor and buy now, when prices are this low. 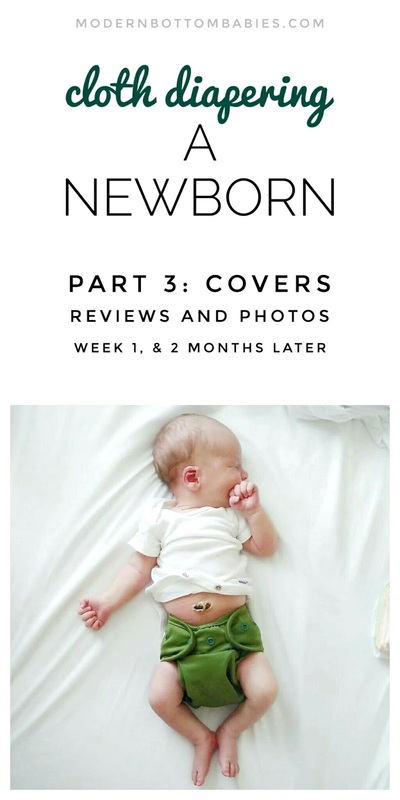 I absolutely cannot gain any commission from these referrals, but they are my strongest recommendations- my favorite newborn covers by Luludew are 15% off, and THE prefolds I recommend from Green Mountain Diapers are also 10% (+5% bundle discount if by the dozen) off! 5. Overnight Diapers: They're expensive, they're not "fun" to buy, so get them when price is sweetened just a bit. Overnight favorites like the Grovia ONE, Thirsties fitted with a Sloomb- wool cover, Diaper Rite AIO, Smart Bottom Dream plus the soaker... all on sale. 6. Wet Bags/ Pail Liners: I know some people really enjoy stocking up on wet bags, but this is always a hard purchase for me. They're a great item to cart if you need to make any kind of price minimum. I love Planet Wise (up to 50% off at Nicki's), and have fallen for Buttons. You can't beat Smart Bottoms' prints, though, man. Every brand of wet bags I know of is discounted, and I need them, so this is actually the one thing I may buy this year...if I don't score Pandamonium. This is a LIMITED, LIMITED edition Thirsties print, only available THIS weekend. As of this posting, it is still in stock for 30% OFF here at Nicki's Diapers, and here at Kelly's Closet. Most retailers have the same discounts across brands, but have different door busters, freebies, and extra points running this weekend. Nicki's Diapers- I love how organized they have theirs! Always, it really is nice and visual. I hope you enjoy your weekend, and are able to take advantage of the amazing sales that are happening! Cloth trainers are finally HERE! I was lucky enough to get to test them out before they were released, and oh.my.gosh. I am seriously blown away with how many features they were able to put on this one cloth trainer to make it SO amazing! Buttons had asked the fans in their official Facebook group about what features were a MUST for cloth trainers. These are a one-size cloth trainer. They have two sets of rise snaps to adjust the height, and three sets of waist snaps to adjust the waist. The waist snaps also mean the trainer can be snapped off in case of an accident. They fit approximately 15-35+ lbs, according to Buttons. There is a built-in cotton/bamboo soaker, to absorb any accidents. The inside of these trainers is lined with an athletic jersey mesh. Oh, AND they have a pocket for adding extra absorbency for when you need more assurance, like overnight, naptime, or leaving the house. They retail for $15 for solids, and $15.75 for prints. 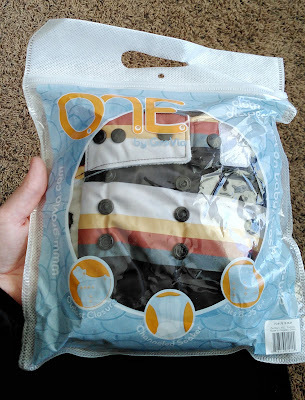 The HUGE bonus is that these double as swim diapers! They really listened and included the features that were most important to me, personally: waist snaps and built-in absorbency. The built-in soaker is absorbent enough to catch a pee. OH WAIT, did I forget to mention Buttons is also now selling 100% cotton boosters? If you read my post on cloth diaper fabrics, you would know how much I absolutely love cotton for everything. These little boosters are so soft and absorbent. They are being sold in packs of two for $10. The boosters go perfectly in the little pocket of the trainer. The fact that this built-in absorbency is a natural fiber just makes my heart sing. I also think the price point is right on. I was hoping Buttons would be able to offer their trainers at an affordable price, and they really came through with that. These are awesome as swim diapers, too. I love to have the little bit of absorbency in swims to catch any accidents on the way to the pool. Ignore the socks. It's winter in Minnesota. The elastic is so stretchy, and they seem so comfortable. Will I try to add absorbency so I can wear them as normal diapers? Probably. Though easy to pull DOWN, the one down-side to me is that my toddler struggles to pull them back up himself. We have this issue with every cloth trainer we've tried, though. And any pants with a wide waist band, honestly. They're just more thick and snug than disposables (and underwear), so I think that comes with the territory of choosing cloth. I'll always be annoying and complain about dry time, too, if they won't dry completely in one cycle. I love these trainers/swims. 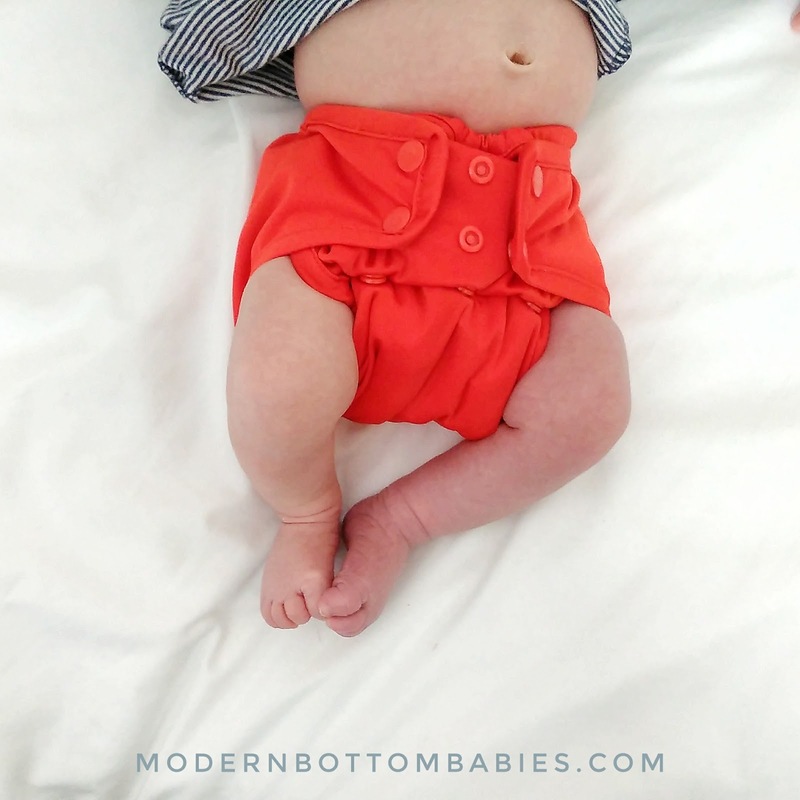 I think they're an amazing contribution to the cloth diaper community. I highly recommend picking up a few pairs for your toilet-learning toddler. I also like to think that I helped with the design, so how I could I NOT love them? They are everything I want in a training pant. I highly, highly recommend giving them a try if you are in the market for trainers. Buttons trainers are currently available exclusively through Buttons' website. 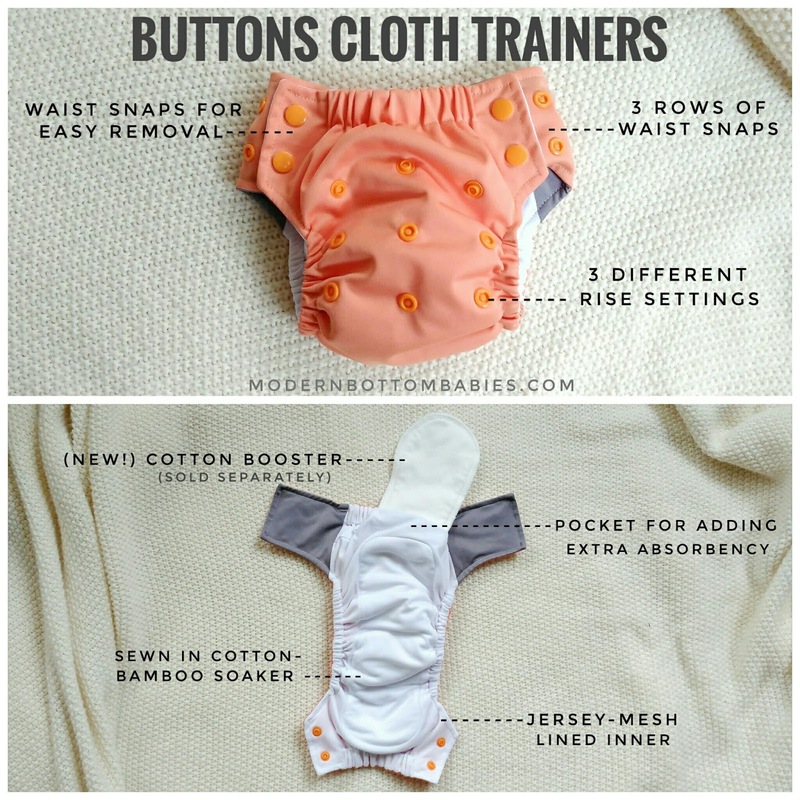 The cotton boosters (and incidentally, some amazing herbal diaper cream I happen to make) can be found under their accessories. Follow me on Instagram for all things cloth. 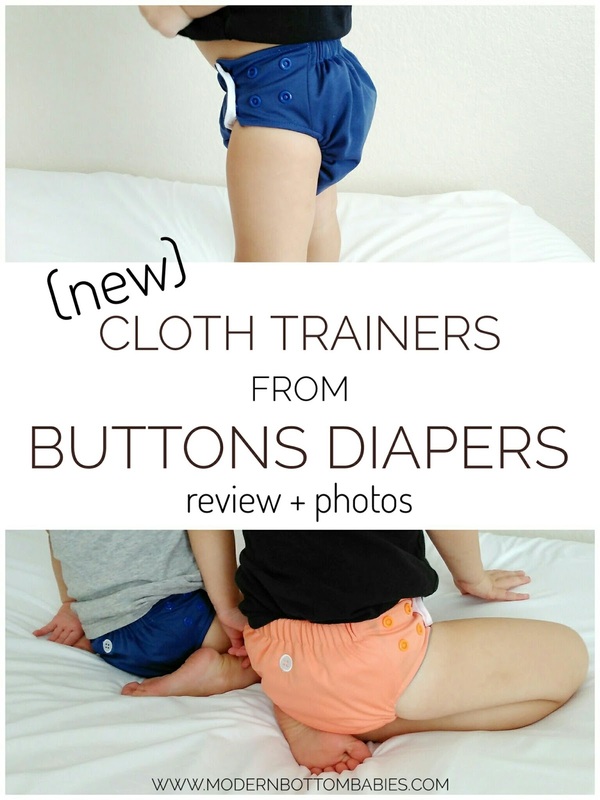 See all my cloth reviews here. 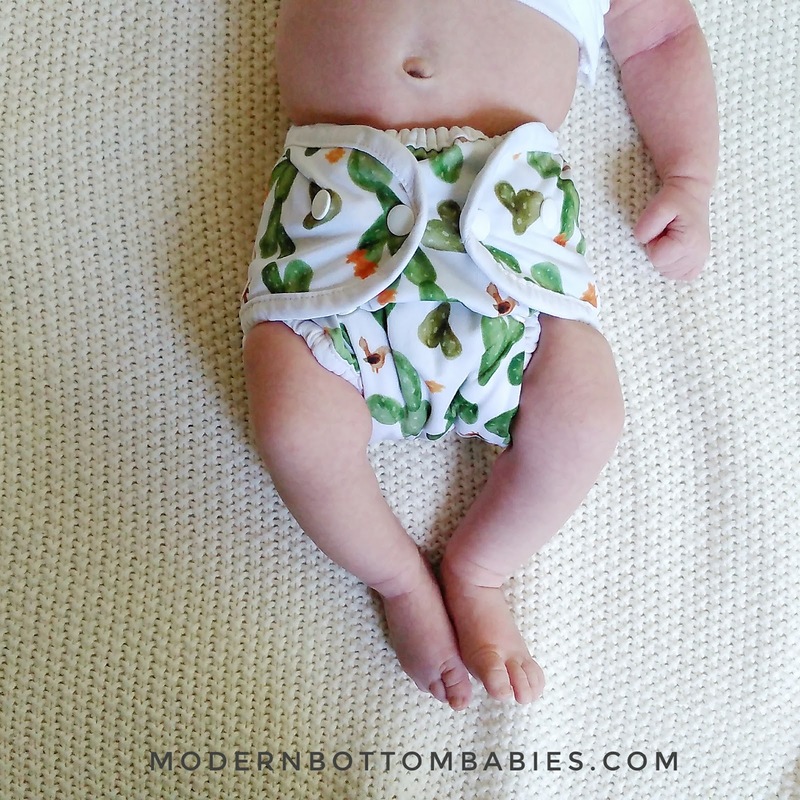 Hands down, the most fun part about cloth diapering is the cute little covers. 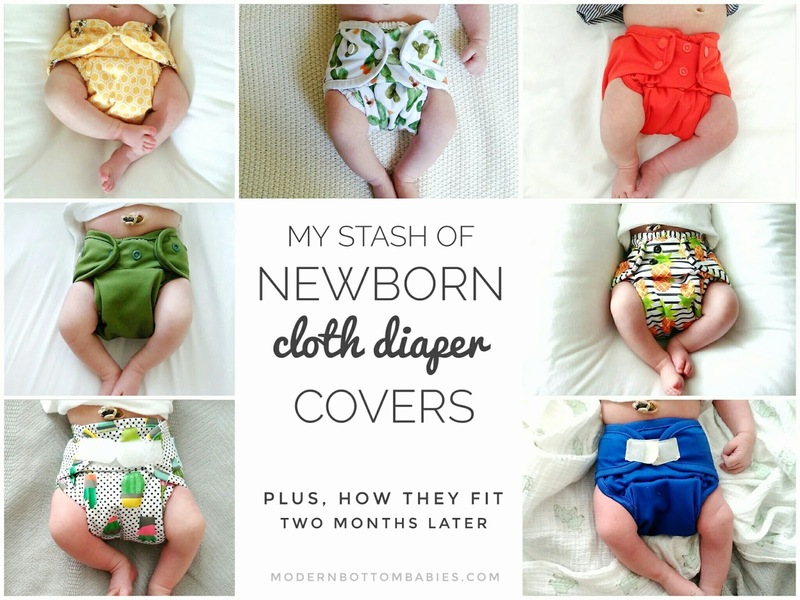 My original newborn stash consisted almost entirely of one single brand- which went completely against what is now one of my top pieces of cloth diaper advice. Those covers did actually work out great for me, but I was more than happy to try a larger variety of them this go around. I wish I had had the opportunity to test even more, but this is what I did. All covers are pictured and used over my favorite newborn prefold, Snappi-ed in an angel fold. We are still using all these covers, at 2 months, and over 10lbs. All of my babies have been pretty average size- between 7 and 8 lbs at birth, and all of these fit under their cords from day one. This post contains affiliate links. Purchases made through these links may compensate me a small percentage for my referral, at no extra charge to you. This was the first newborn cover I purchased, over three years ago. It is one of my favorites. Pros: It's very small and trim, which I absolutely love. The hook & loop makes it easy to use. Double gussets help contain explosive newborn poop. Cons: It is a small cover, so though I love it for my average-size babies, it may be maxed out quickly for larger babies. It doesn't work well over fitteds or bulky inners. It is ONLY available in hook & loop, which just isn't as durable as snaps. Though very similar to the Sweet Pea cover, there is something about this one that I like just slightly more. I think it may be the slightly larger cut, and the extra softness and thinness of the PUL. It gives it an effortless, amazing fit. Pros: Also small and trim, but with better coverage. Double gussets keep everything in. Extra soft and trim cover. Comes in both hook & loop and snap closures. Cons: A newer brand, not available at many retailers. May also max out early for bigger babies. I was initially nervous that this cover only came in snaps, but it completely converted me. It gives SUCH and amazing fit from day one. I highly, highly recommend it for little babies. Pros: Fits small and trim. It was the best fitting diaper in the first two weeks. Double gussets hold everything in. Made of super soft, stretchy PUL. Has tuck flaps, for fans of those. Cons: It runs small, and it is the first cover we're going to outgrow. I feel like when the rise is out, the fit is just off. It needs more waist snaps, so it can fit a wider waist, then it would be absolute perfection. Bigger babies will max this one out very quickly. I was SO skeptical of this newborn cover, because it the largest cut of any newborn-specific covers in my stash. It was more bulky in the first couple weeks for us, but it worked. Became one of my absolute favorites at 2 months old. Pros: Double gussets and elastics all around contain everything. Fits well over fitteds and bulkier inserts. Has the most longevity of any newborn diaper cover I own- there's people putting this one on their 12+ month-old-babies! PERFECT for bigger babies. For some reason, out of all my covers, this one NEVER wicks moisture when the insert is soaked. Cons: May be bulkier on small babies (I found from 9 lbs and on, the fit was awesome). I have no qualms about saying this was my least favorite cover. Interestingly, it was THE most recommended on an Instagram crowd-sourcing poll I did awhile back. I find the elastics too tight for how thin the PUL is, so it always went wonky when trying to put on. The gussets would fold around and everything. I also feel like it's cut too wide between the legs, so it folds oddly there. This will be the one I de-stash. Pros: Double gussets. Available in both snap and hook & loop closures. Larger fit, for bigger babies and over fitteds. Cons: Unfortunately, almost everything for me. They always seem to fit bulky, even at 2 months. Getting a good fit isn't effortless, the way I think it should be, because of the elastics and how thin the PUL is. If you've read my review on Duo Wraps, you would know I am a huge fan of the size 1. They do work from birth, though quite bulky. Pros: Double gussets. Fit well over fitteds- was my go-to overnight cover. Could be a good newborn diaper for bigger babies. Cons: Bulky for babies under 10 lbs, and probably any weight baby at the beginning, due to all the fabric between the legs. This was always the first one-size diaper to fit my babies. It does actually fit from birth, though it is bulky- not nearly as bulky as other one-size. I was glad to have a ton of these in my regular stash, because I had to supplement on days when all my covers got pooped on. Pros: Double gussets. Affordable option for those who don't want to invest in an actual newborn stash. Cons: Bulky, especially for smaller babies. Overall, I highly recommend trying a variety of covers. Different covers will work differently, depending on the size and shape of baby. Two months old is around the time that a lot of one-size diapers will begin to fit the average baby. A lot of newborn diapers will actually go beyond that stage, and give a much better fit still than the one-size will. For smaller babies and the best fit at the beginning, though I slightly prefer to fit of the Luludew newborn cover, Sweet Pea would be my top recommendation, just because it's more accessible to purchase. For longevity and bigger babies, Buttons newborn are my hands-down winner. Almost all covers (except Luludew) can be purchased at my favorite diaper retailer, Diaper Junction. They're also available on Amazon, Kelly's Closet, and Nicki's Diapers. Luludew can be purchased through their website, but you should request for your favorite retailer to carry them! 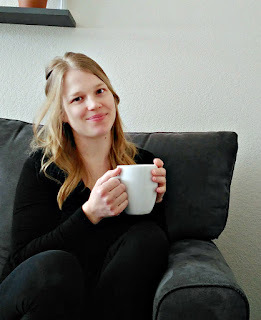 I hope you have found my newborn series helpful. I have actually decided to extend it a four-part series, because there are a few points I didn't get to touch on in these three. Part 4 with be FAQ, so if you have any remaining questions- ask away now! I will include them in that post.